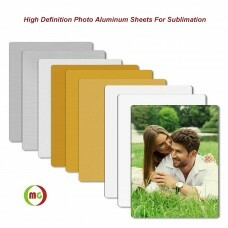 The HD Sublimated Aluminum metal sheeting with various size and thickness are idea for HD photo subli heat transfer. These aluminum photo panels have a high quality sublimation coating that is moisture proof, dent & scratch resistant and are also fade resistant. Additionally, these high quality sublimatable photo panels have a special UV coating applied giving them UV resistance. Photos printed on these sublimatable photo panels are bright, vibrant, and has very vivid color.